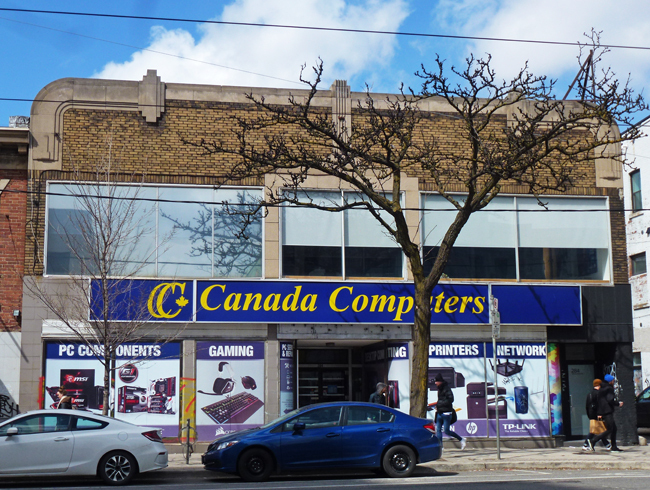 I took this pic a few weeks ago before the leaves came out on the trees so that you can see most of the wonderful Art Deco details on this College St building. I couldn't find any info on its original occupant but it was a paint store for many years before becoming a computer store. There is a bit of a campaign going on to attempt to have some of the buildings along this part of College St heritage protected but I'm not sure if it has been successful. It is good to see old buildings still being used. Your sign makes me wonder if Canadian Computers speak with an accent? Ahy? Fine looking building. Always liked the Deco style. Well you know I'm loving those Art Deco details Pat, fabulous find! ...this like many buildings here, the lower floors have been destroyed and only the tops retain their former beauty. I love those decorative touches on this building. It would be great if such pretty buildings could be preserved in some way. I like its style. A building worth preserving. Hello, I like the Art Deco style. It would be nice to see some preserved. I love such old places too! A clash of cultures between upper and lower storeys. Hopefully it has some historic status and is protected, it's a neat building! Love the deco. Hate the garishness of the computer store. I hope they can preserve the building. It is still functional and that will help its cause. Its a nice building, I like it. I am a fan of art deco! I was there the other day and took pics of those buildings and couldn't find out much about them either. Do hope that wiser minds help save some of these historic buildings!